A few Heywhatsthat.com visibility cloaks shown at once in Google Earth as a multi-summit panorama view for particular location. In this part of the article I would like to say more about multiple summit-perspective views in Google Earth. 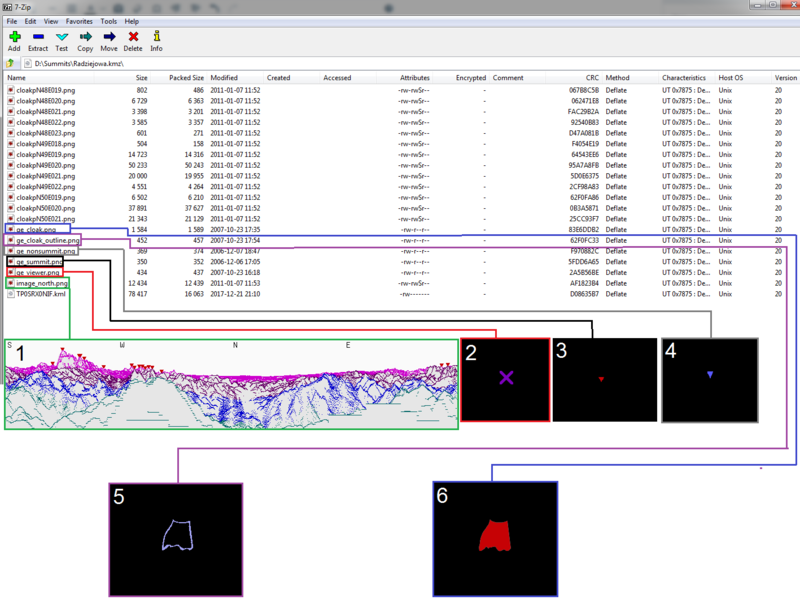 First of all previously I have described largely how to manage the heywhatsthat.com panoramas in Google Earth at all. Now you will see how to put a few summits into your Google software and manage them correctly. Let’s start then. In the first part of this article I have shown you how to generate your own panorama in Heywhatsthat.com. Though there is an option to choose existing panorama (Pic. 1) and make some steps a bit quicker. Not all summit views are included, but you can find a main peaks in a mountain communities. Pic. 1 Panoramas provided by Heywhatsthat.com for Polish Carpathians. When you found your peak, then click on it and go to “View” option (Pic. 2). The summit view will be automatically generated the same like you would create it yourself. Pic. 2 Select the summit, that you are interested in and click View. Pic. 3 The Radziejowa summit visibility cloak in Google Earth. You have got your summit perspective view in Google Earth marked red, that is basically provided by Heywhatsthat.com page. Let’s green it off. Read below what should we do with it. First of all a brief explanation what is the difference between .kmz files and .kml files. As you know both can be used in Google Earth. 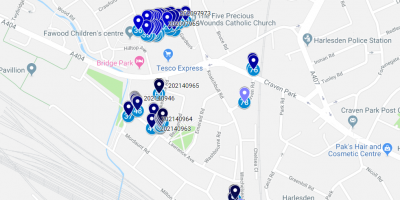 The difference is, that .kml file provides a simply Google Earth file for you whilst .kmz files includes a pack in which a simple files has been built up a whole Google Earth object. 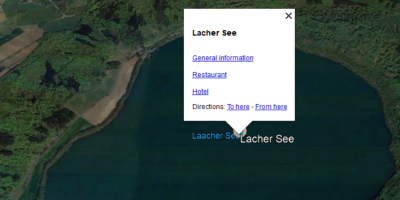 We can take a simply insight into all elements using left toolbar in Google Earth (Pic. 4). Pic. 4 The Radziejowa summit with all elements consisted with .kmz file. We cannot really edit those elements. To prepare them for your needs you need to use the 7Zip File Manager software (Pic. 5). Pic. 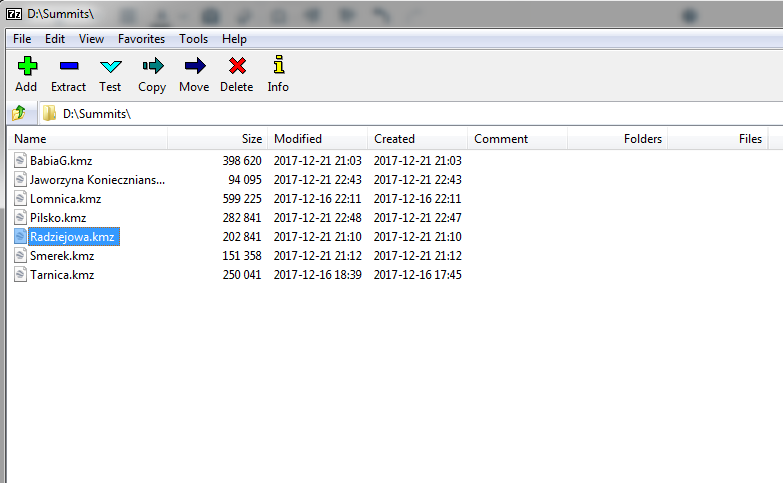 5 The 7-Zip File Manager with all summits considerated. “Radziejowa” file is going to be first one. Once you double click on the file you open it and see all stuff consisted with your newly generated summit-perspective view on the Google Earth (Pic. 6). Pic. 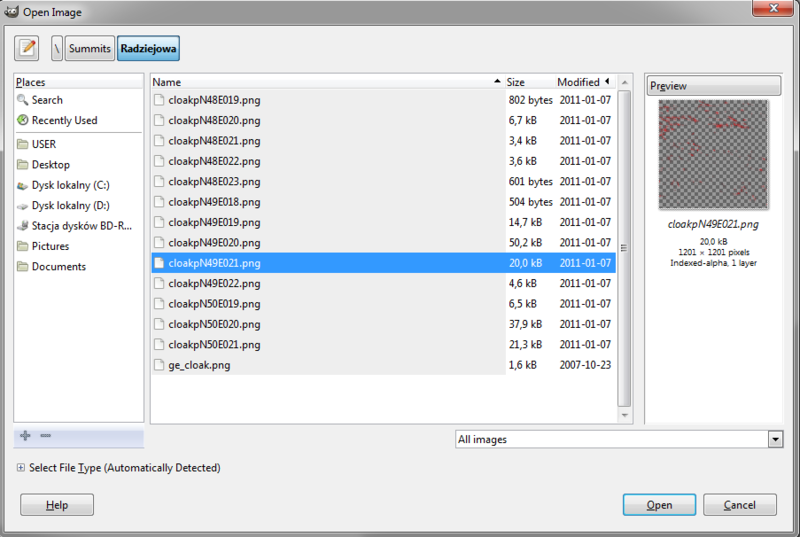 6 All files consisted with the “Radziejowa.kmz” file seen in the 7-Zip file manager. Let’s look on all .png files, that you will be able to edit soon. I would like to describe you shortly every file included. 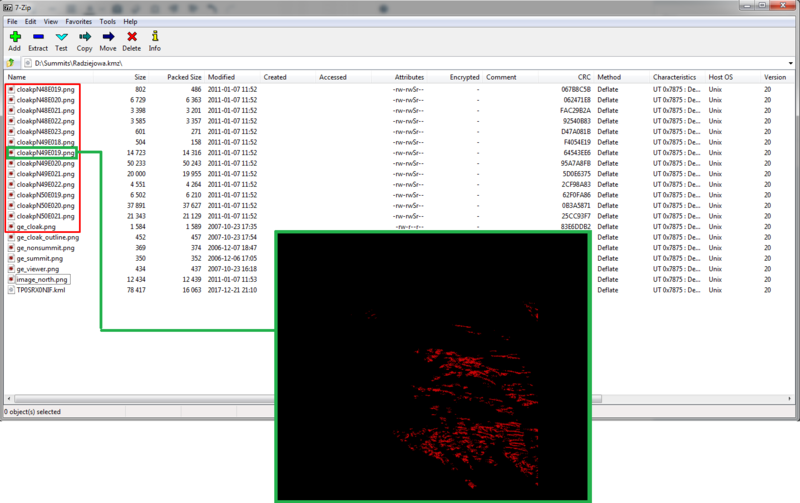 You can insight all files even without extracting them (Pic. 7). Pic. 7 The PNG files included in the “Radziejowa.kmz” file: 1 – “image north.png” – the summit panorama (to be displayed in Google Earth), 2 – “ge_viewer.png” – a cross, that roughly indicate your summit, 3 – “ge_summit.png” – a upside down red triangle, that shows other prominent summit seen from your summit, 4 – “ge_nonsummit.png” – a blue upside down triangle, that shows other places near to your summit, 5 – “ge_cloak_outline” – the line, that delineates the horizon at the top of your summit (this file is to be changed directly in the Google Earth also), 6 – “ge_cloak.png” – the colour of the visibility cloak provided by heywhatsthat.com for your summit. Pic. 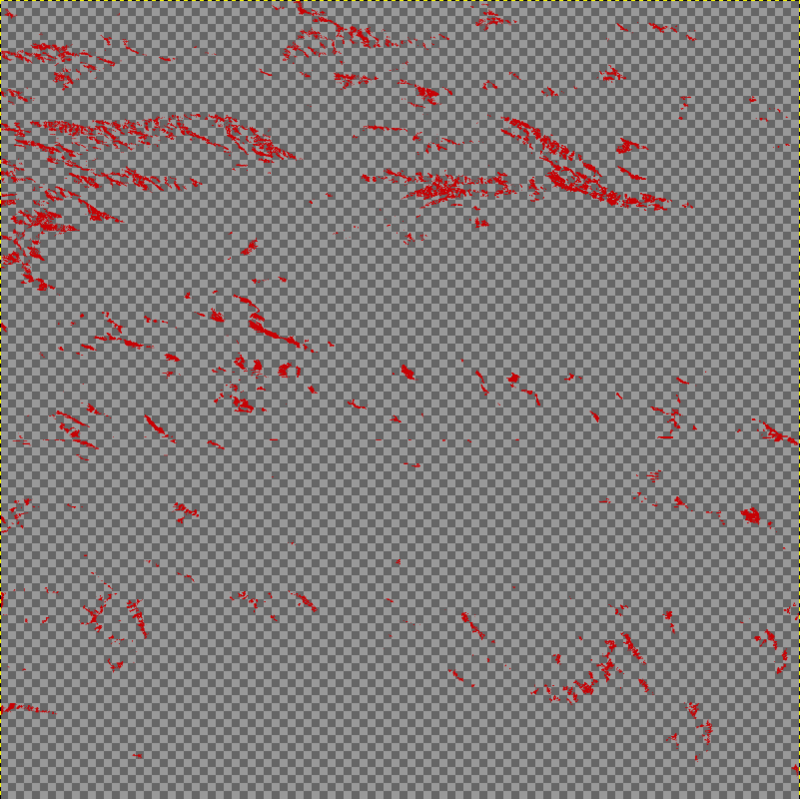 8 The PNG files included in the “Radziejowa.kmz” file: red marked – files, that should be considerated when changing the visibility cloak layer, green marked – an example of part of the visibility cloak provided by heywhatsthat.com for the Radziejowa summit. 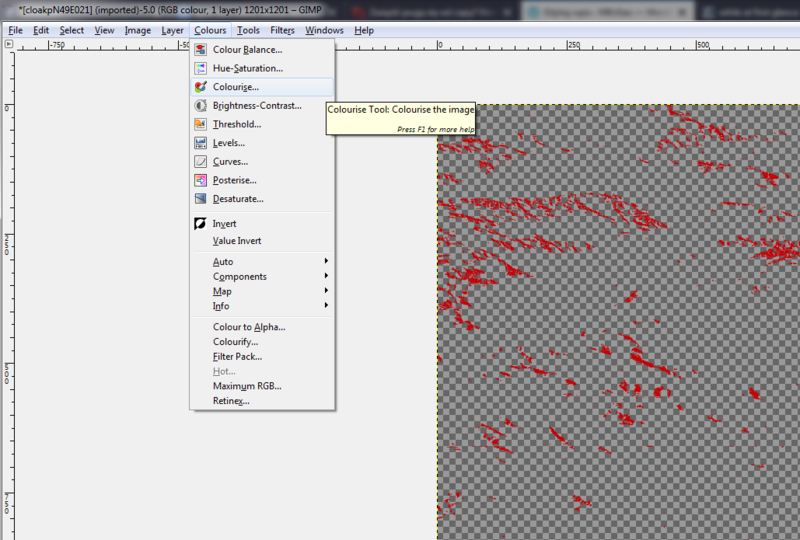 I have been using the IrfanView software hence the background is each file opened. Basically those files represents the vector graphics, that allowes you to make a changes keeping transparency. Now, when we know all graphic files, that builds panorama from our summit we can start to make a changes. 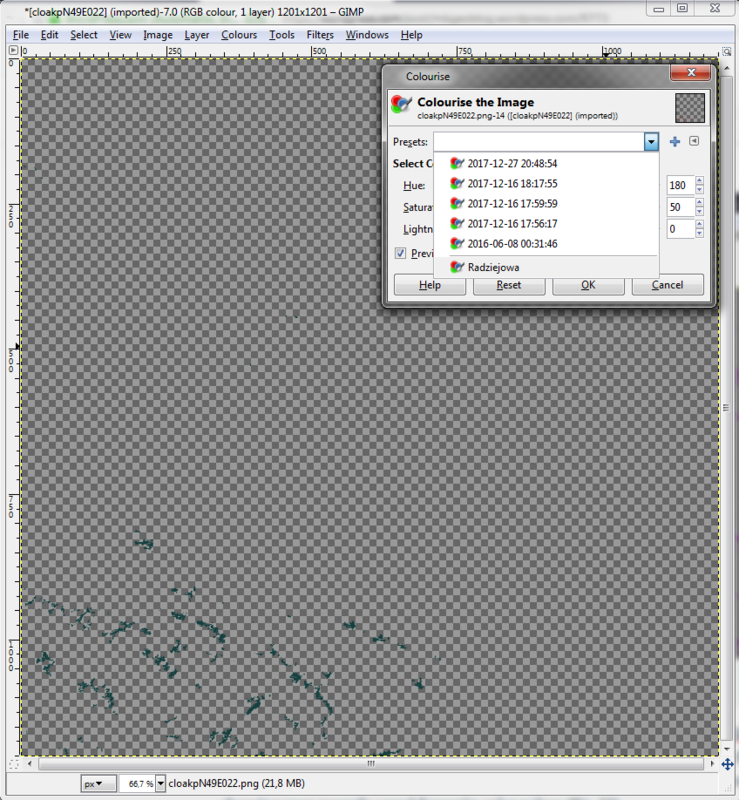 At the first we should extract all .png files outside the .kmz file to make them editable. Select all files marked red (Pic. 7) then and copy them into your folder (Pic. 9). Pic. 9 Extraction of .png files into the folder. 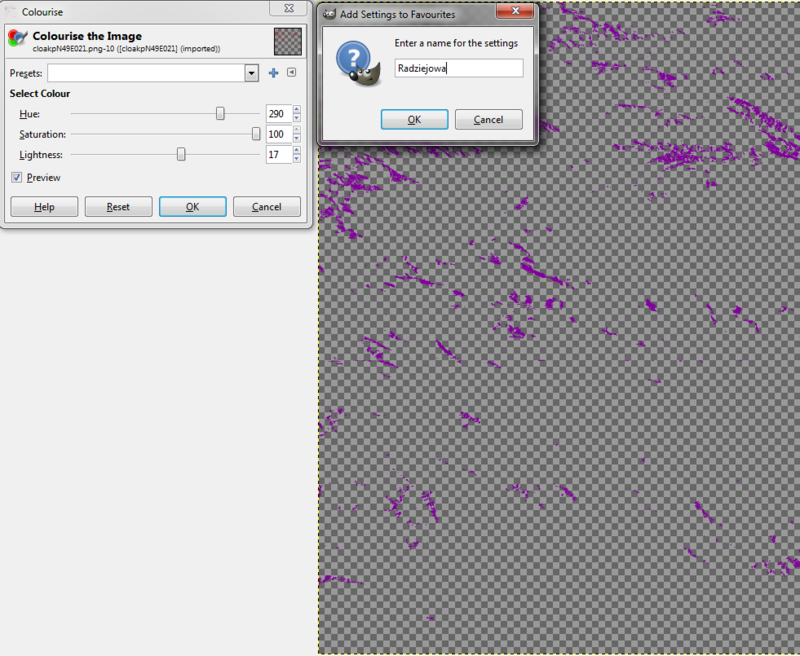 The best software to open the extracted files is Gimp. This is an opensource graphic software that allowes you to change the visibility cloak colour easily. If you are not equipped with this software, you can download it free from the main website. Once you got the Gimp open it and go to the main toolbar, where you click File -> Open -> .png image from your folder (in our case it will be “Radziejowa”) (Pic. 10). Pic. 10 Opening one of the .png visibility cloak images in the Gimp software. You can preview each file on the left when click. At first glance some files may look empty, but you need to know, that the visibility cloak has been divided on the sections (initially by Heywhatsthat.com when you have transfered it into Google Earth), that are a wide rectangulars. Every rectangular represents the visibility cloak coverage in rough longitude and latitude range. 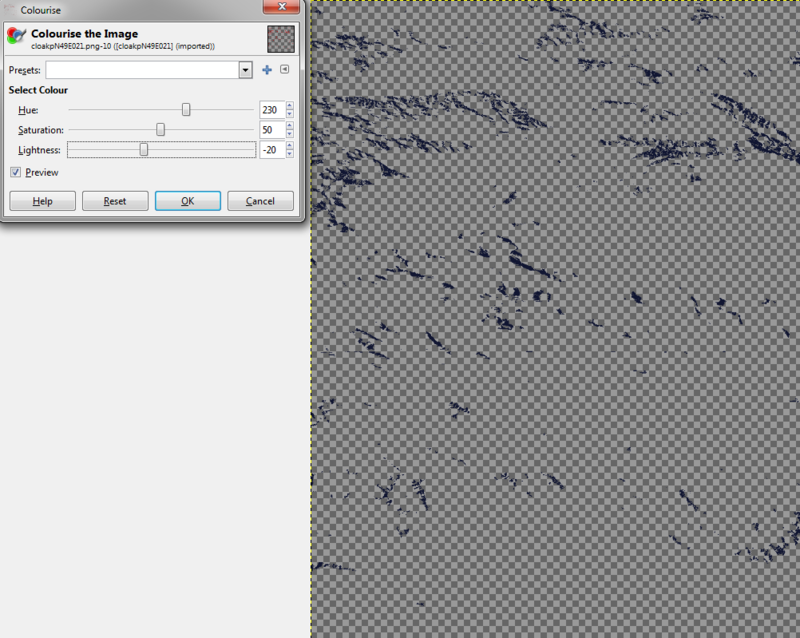 you can see those ranges in the .png file names as per as above (Pic. 10). 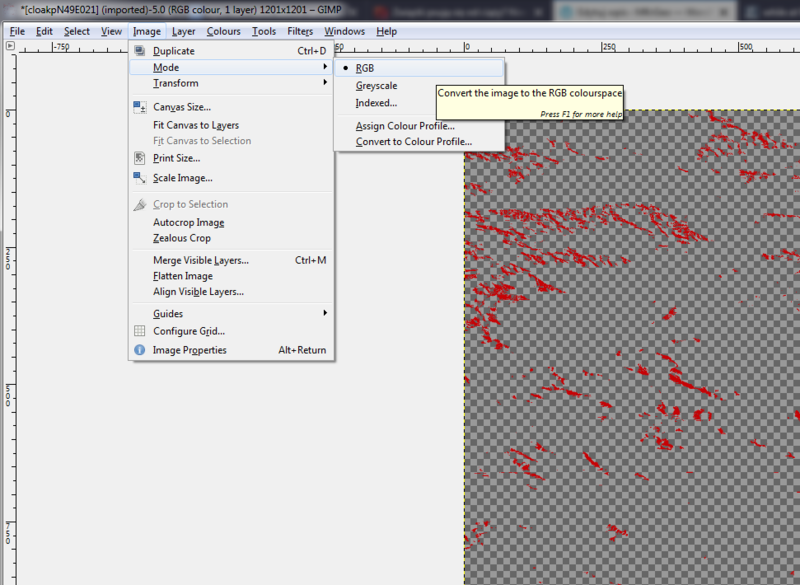 When you have chosen the .png file, that you are going to edit you should see your image in full size (Pic. 11). Pic. 11 One of the .png file opened in the Gimp software. Now we can start to edit this .png file. We don’t want to have a red color in our visibility cloak. Before you start make sure, that your image mode is not indexed! (as a default). You have to change it into RGB mode (Pic. 12). Pic. 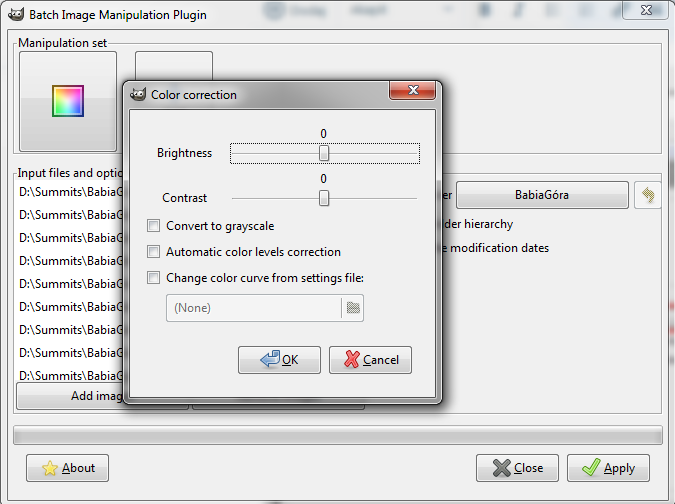 12 Changing your Gimp image mode – select RGB rather than Indexed (default). After this small step you can start to edit your image. One thing, that you should aim at is colourising. Any other options while from toolbox are not recommended! To change the default color go to the ‘Colours” section in main toolbar and select “Colourise” option as per as below (Pic. 13). Pic. 13 The location of “Colourise tool” in the Gimp 2.8 software. – Lightness (-100 – 100) with 0 as a default value. I not recommend you to put extreme values, because finally you will gain a black (-100) or white (100) colour only. Pic. 14 The image colourise options with example values, that has been turned your .png image into green. Pic. 15 – 18 The color examples for one part of the “Radziejowa” visibility cloak: 15 – blue, 16 – dark blue, 17 – fair blue, 18 – fair blue with max. saturation. When you have set your color properties remember to add your settings to favourites (Pic. 19, 20). Due to this issue you can save a little bit of time in the nearest future. Pic. 19,20 Add your color settings to favourites. Your last step is saving. The quickest way to do it is overwriting the file (Pic. 21). 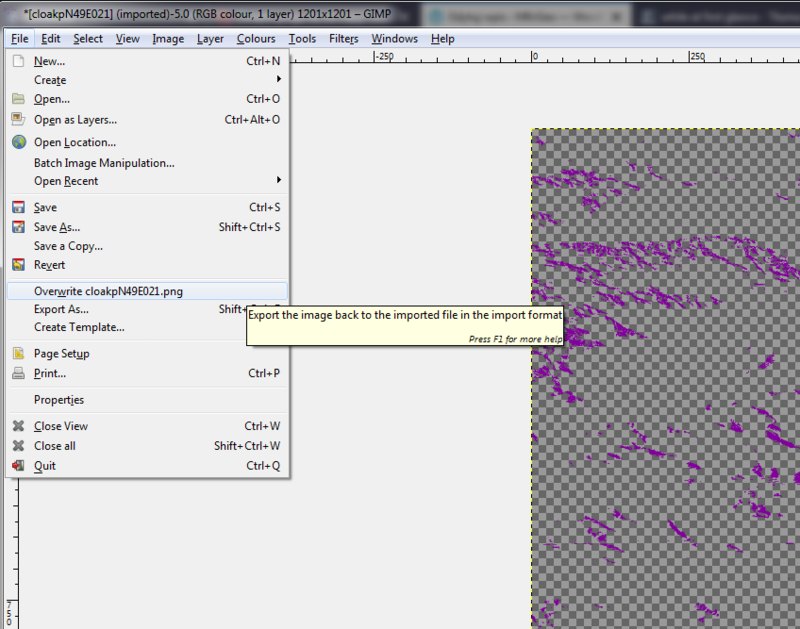 Otherwise you save the file in .xcf extension or export the image with risk of loosing the quality. Overwriting the file is the quickest and the safest way in this case. Pic. 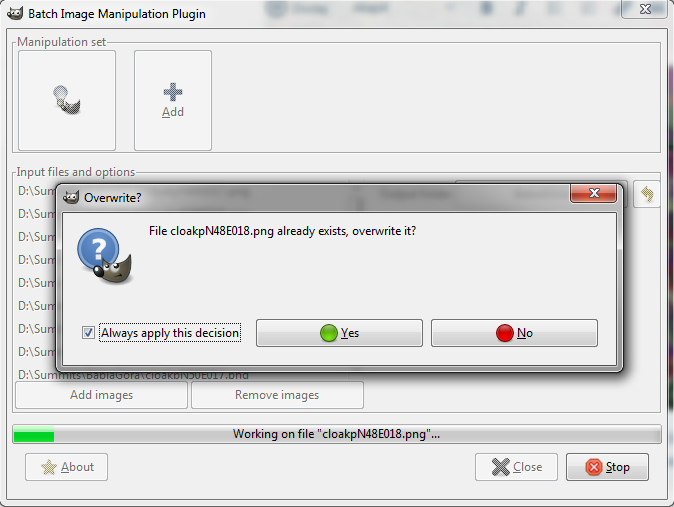 21 The overwriting file option in Gimp 2.8 software. This is not only one file to edit. As I have shown you above there are several files in your folder that needs to be kept in the same color. You have to repeat this process for every file. Id doesn’t look optimisticly, however you can do it much quicker than first one, choosing your recently saved favourite color values (Pic. 22). Pic. 22 Selecting recently saved color settings in Gimp from the favourites list. Our last .png file is “ge_cloak” situated usually at the bottom of the list. This image (Pic. 23) with RGB mode default should be changed too, although you can use it as it was. When you decide to leave it with red color it may be misleading so better change this image also (Pic. 24). Pic. 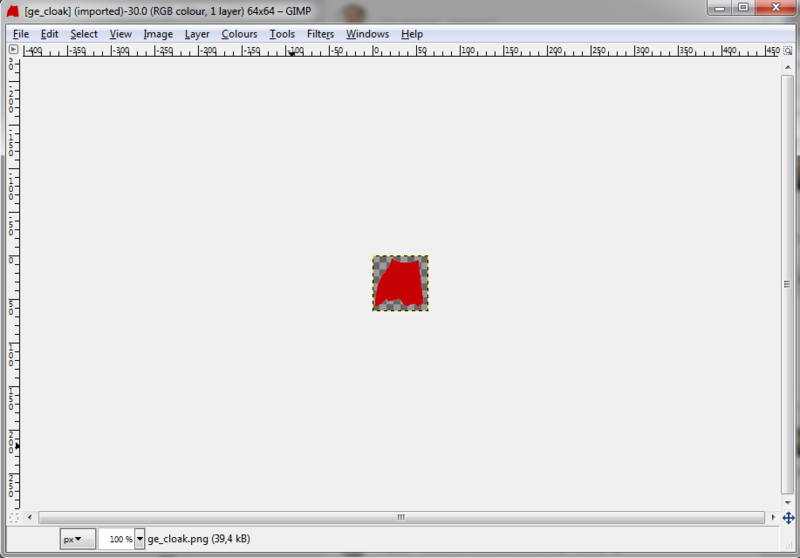 23, 24 Changing the “ge_cloak.png” file in Gimp. All done! To see it in Google Earth you need to copy all overwritten .png files back into .kmz main file when you have 7-Zip File Manager open (Pic. 25). Pic. 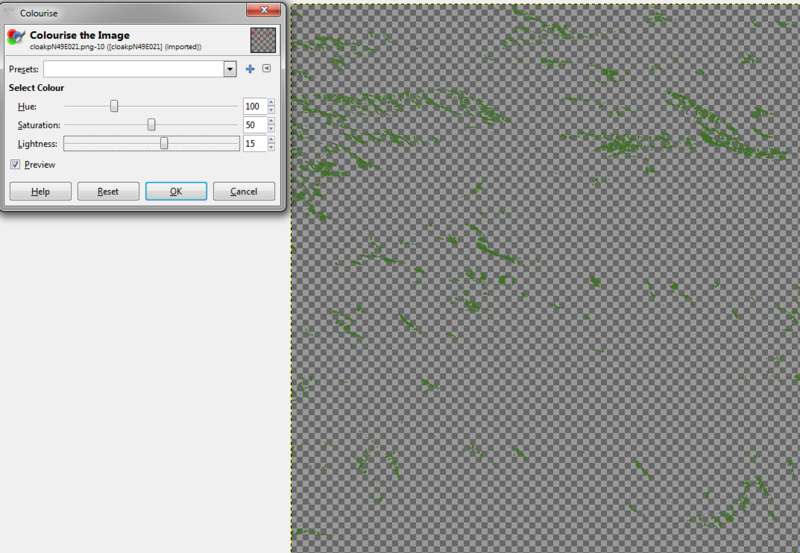 25 Copying and owervriting the .png visibility cloak parts in the main .kmz file. Now, we can enjoy the view in Google Earth (Pic. 26). Make sure, that you have copied all parts properly. Bear in mind, that your .kmz file is now slightly bigger, so opening all visibility cloak layers may take a little bit longer especially for the first time. Pic. 26 The Radziejowa summit purple visibility cloak displayed in Google Earth. Pic. 27 The Radziejowa and Łomnica summit visibility cloaks on the one snap. Now you can distinguish both cloaks easily! Gimp provides also another option to change the color of your visibility cloak only when you have a Batch Image Manipulation plugin installed. – Color correction (Pic. 30, 34): you can change brightness and contrast of your image or convert it into greyscale. It may be helpful when you need to modify a color arleady existed. Some similar things you can do using a Google Earth also. – Other GIMP procedure (Pic. 31): icludes a long list of processes, that can be taken in batch procedure. From this list you should pick up “gimp-convert-rgb” (Pic. 35) as a first and “gimp-colorize” (Pic. 36) as a second. To find them quicker you can use a researcher on the left top (Pic. 35, 36). Pic. 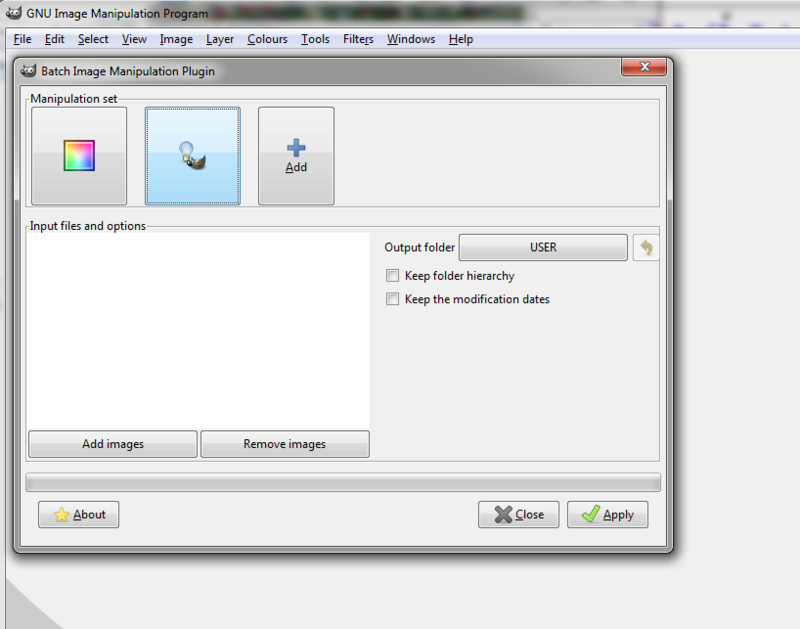 28, 29 The “Batch Image Manipulation” option in Gimp software. Pic. 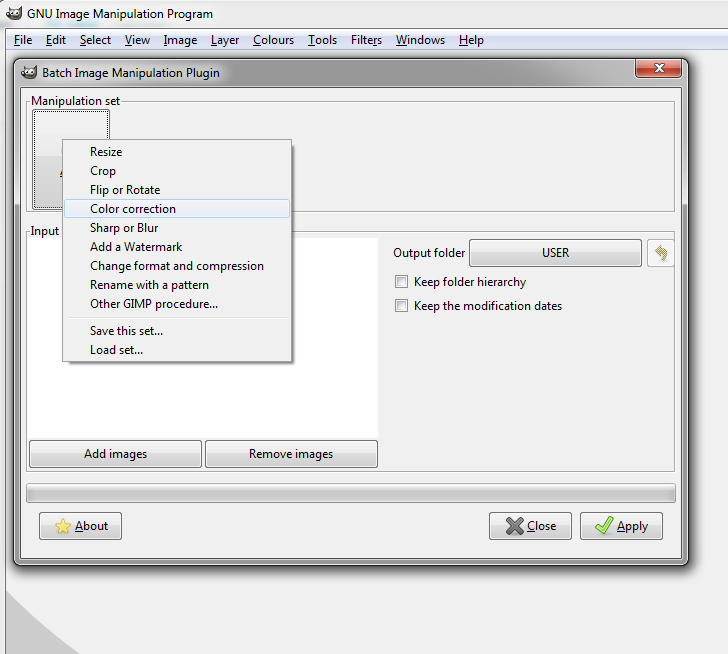 30 The “Batch Image Manipulation” drop-down option list in Gimp software. Pic. 31 Both “Color correction” and “Other gimp procedure” options has been added to our barch conversion. Pic. 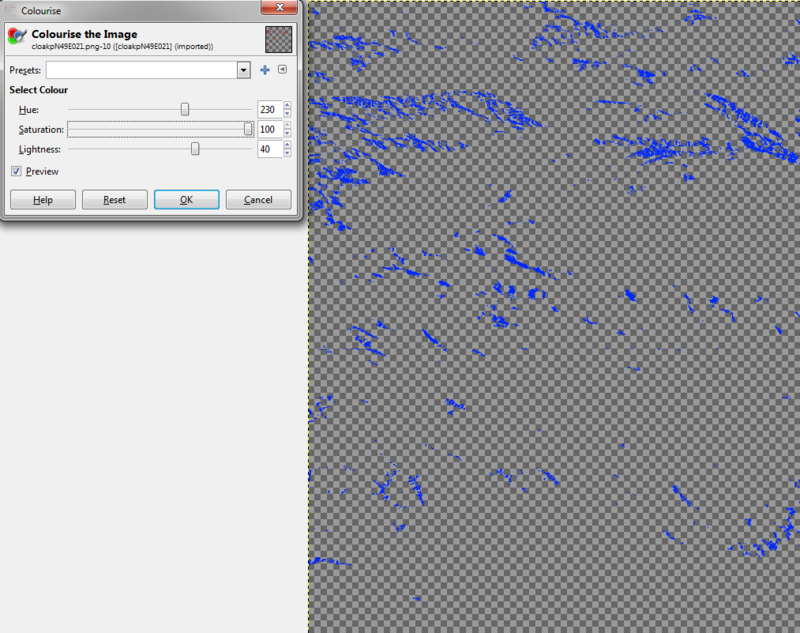 32, 33 Selecting the images for batch conversion. 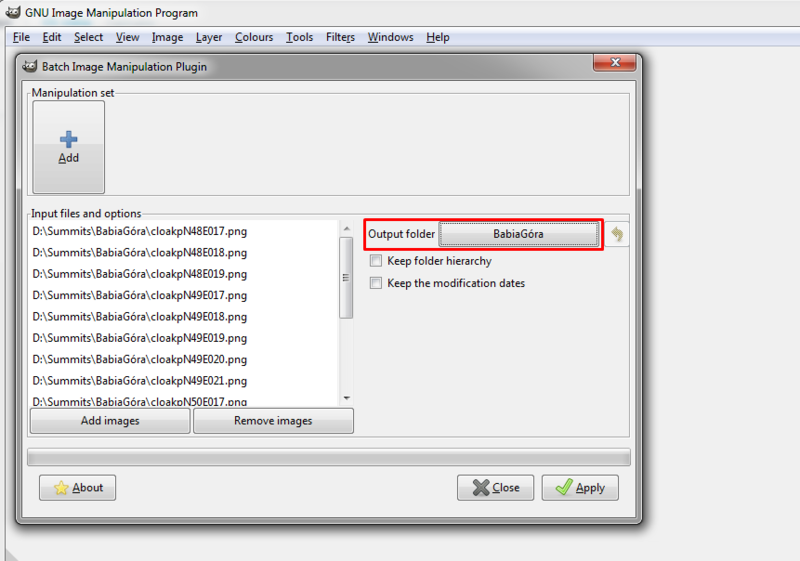 Make sure, that your output folder and current summit folder are the same! Gimp are going to rewrite all files automatically. Pic. 34 The “Color correction” with all options provided. Pic. 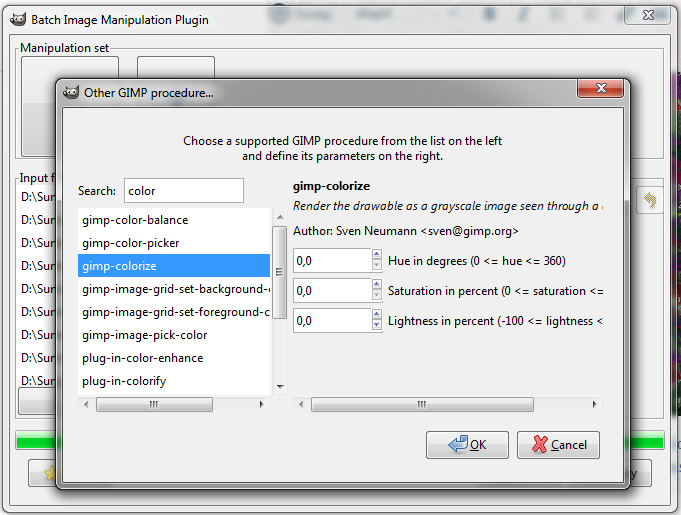 35, 36 The Batch Image Manipulation options in Gimp 2.8 software: change image mode to RGB and image colorize. 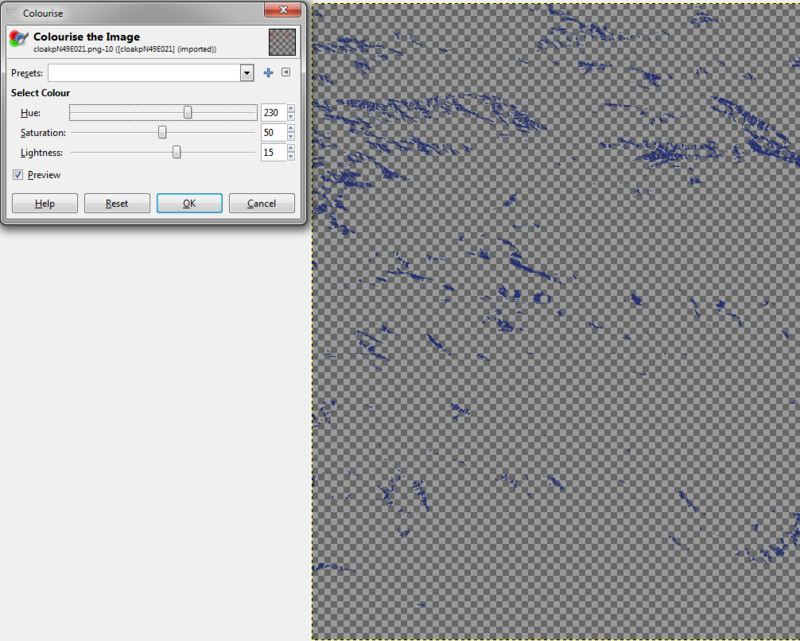 Aforementioned snap shows the values, that can be changed in “gimp-colorize” option. There is no visual color information. You need to be more or less clued up in the RGB scale (I described it a bit earlier) and put a correct values. 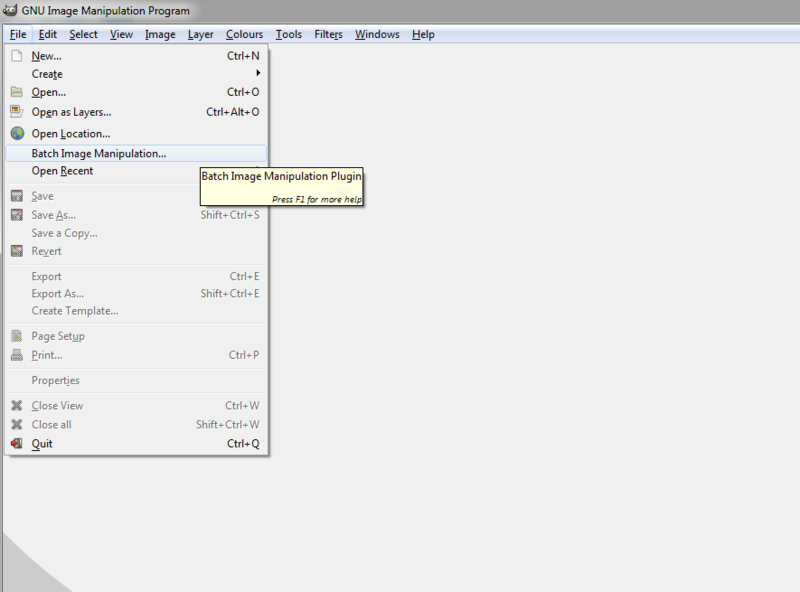 Once you have done everything arlight click OK, and next go “Apply” to carry out whole batch procedure. Pic. 37 When this communicate is displayed always click “Yes”. After all you can do the same like in previous example. 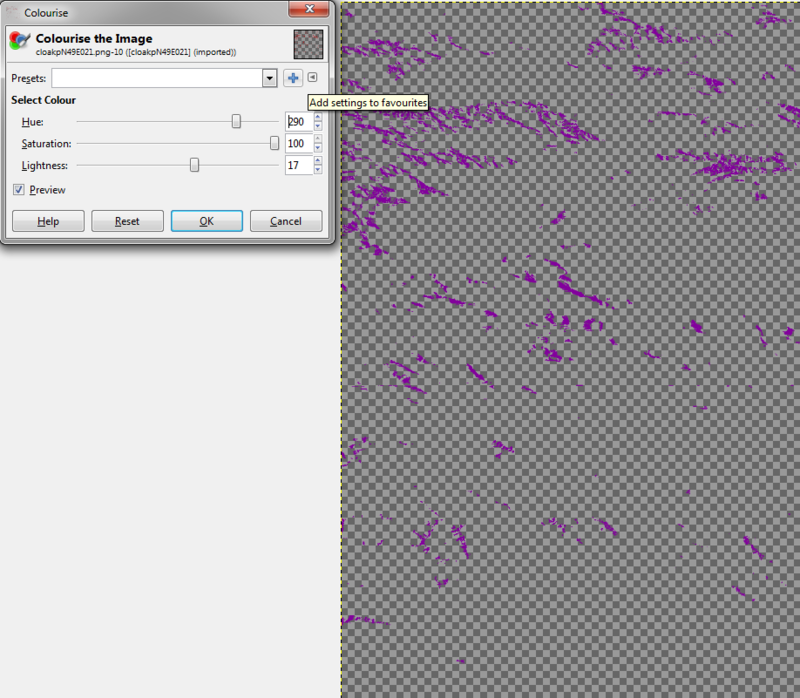 Copy all .png files into the .kmz file and enjoy a new color of the visibility cloak (Pic. 38). Pic. 38 The Babia Góra summit visibility cloak in terms of the previous ones (Łomnica and Radziejowa). Now, when you following my steps you should have 3 visibility cloaks overlapped on your Google Earth, each in different color. Remember to change the color of the horizon pattern (I havent done it yet) otherwise you will get lost. I prepared another 4 summits for myself, so I will repeat those steps and put all together in Google Earth. Pic. 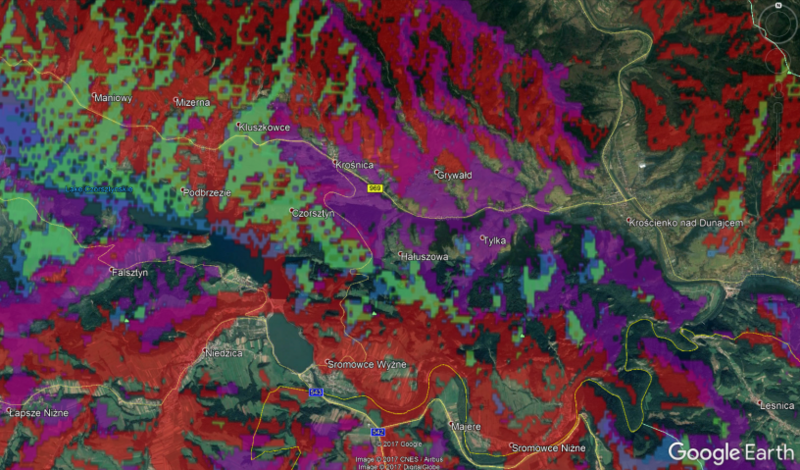 39 Visibility cloaks overlapped on each other: green – Pilsko, blue – Babia Góra, red – Łomnica, purple – Radziejowa, orange – Jaworzyna Konieczniańska. Pic. 40 Visibility cloaks overlapped on each other: red – Łomnica, blue – Babia Góra, purple – Radziejowa, orange – Jaworzyna Konieczniańska, pink – Smerek, grey – Tarnica. Pic. 41 The mountain communities, that are to be seen from Strzyzowskie Foothills near Pilzno town: blue – Babia Góra (Beskid Żywiecki), red – Łomnica (Tatras), orange – Jaworzyna Konieczniańska (Beskid Niski), pink – Smerek (Bieszczady), purple – Radziejowa (Beskid Sądecki). Pic. 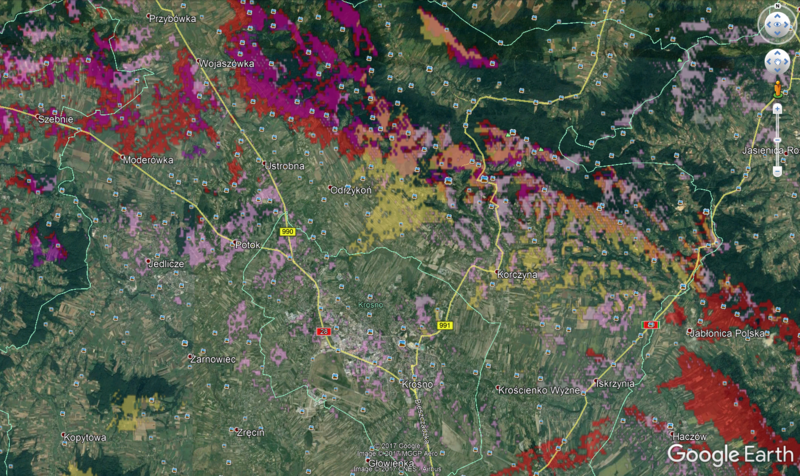 42 The mountain communities, that are to be seen from Dynowskie Foothills near Krosno: red – Łomnica (Tatras), orange – Jaworzyna Konieczniańska (Beskid Niski), purple – Radziejowa (Beskid Sądecki), pink – Smerek, grey – Tarnica (Bieszczady). Pic. 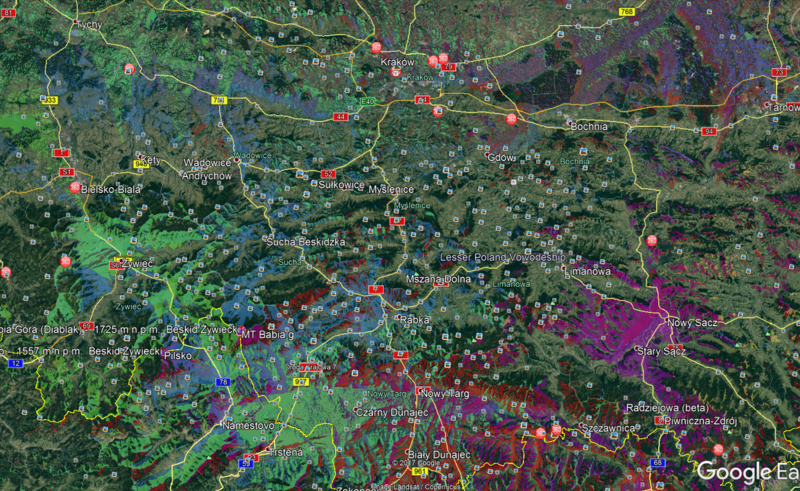 43 The summits, that are to be seen from Pieniny mountains: red – Łomnica, green – Pilsko, blue – Babia Góra, purple – Radziejowa. Pic. 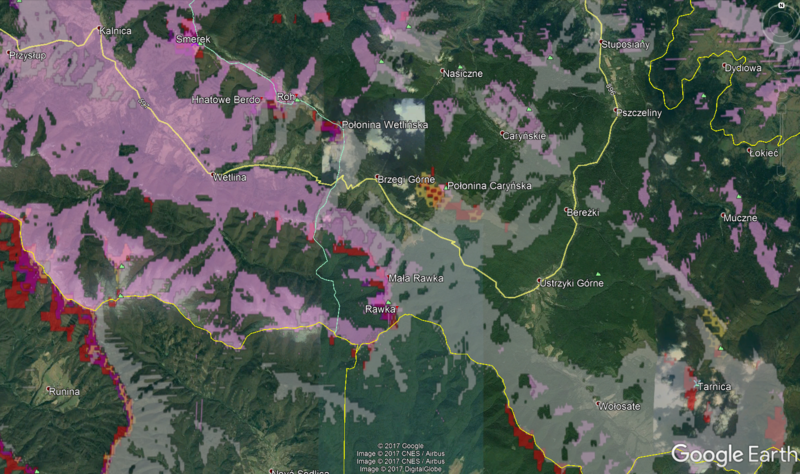 44 The summits, that are to be seen from Bieszczady mountains: grey – Tarnica, pink – Smerek, orange – Jaworzyna Konieczniańska, purple – Radziejowa, red – Łomnica. One suggestion at the end – don’t put too fair and grey colours. Tarnica summit visibility cloak example shows, that is easy to merge into another visibility cloak layer. 1. 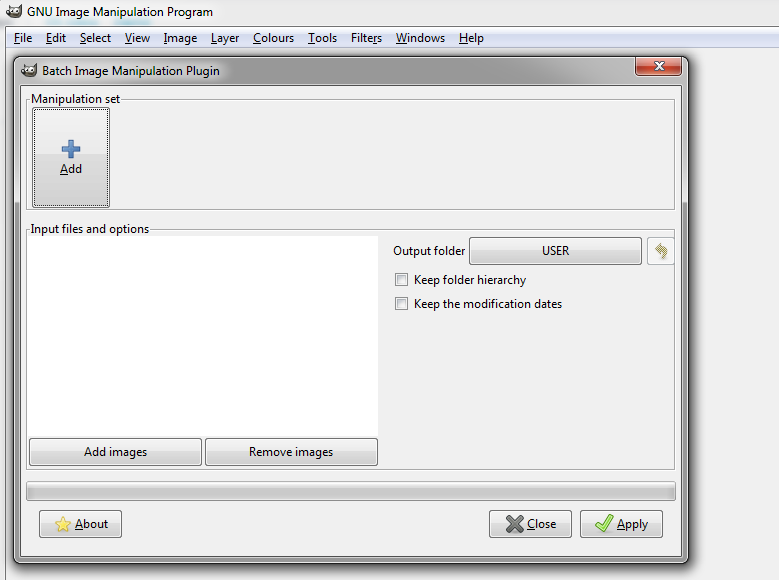 Gimp – GNU Image Manupulation Program – main page.